← Shenzen, China. May 21st, 2013. Wrenshall, Minnesota. May 25th, 2013. Members of the Wrenshall Fire and Rescue Squad could hardly believe their eyes when they responded to a call along the Willard Munger State Trail on the evening of May 7 and found a horse swallowed by the ground. Melissa Aurand of Eagan, Minn., had been riding a horse named Stormy, belonging to her husband’s stepfather, Hank Dubrent, along an unpaved stretch of the trail just before 7 p.m. Her husband, Zach, was riding ahead of her. Alert to what was happening, Zach jumped off his horse and ran back to where Melissa was checking to see if the wrist she had landed on was injured. “The horse was slowly sinking into the ground, like she was in quicksand,” Melissa said. Zach grabbed Stormy’s halter and tried to tow her out with his horse, but to no avail. Stormy went from sliding slowly into the hole to disappearing completely beneath ground level. Through it all, Melissa said, Stormy remained calm. “She’s the most amazing horse ever,” Melissa said. 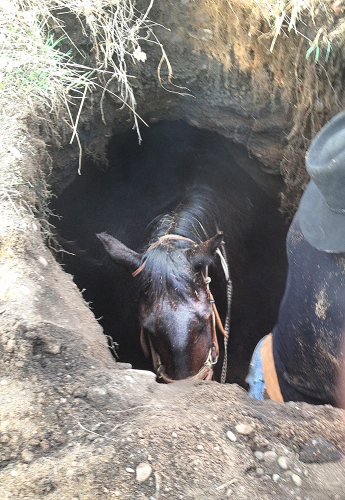 Zach jumped down into the gaping hole to check on the horse and keep her steady until help arrived. Melissa said her cell phone was in her saddle pack, so Zach had to dig it out and toss it up to her so she could call 911. When seven responders from Wrenshall Fire and Rescue pulled up, they walked to Melissa and said casually, “How’s it going?” It was then that Zach stuck his cowboy hat up through the hole and started waving it at them. Laveau said the sinkhole was big enough for the horse and Zach to stand up in. A Carlton County sheriff’s deputy who also had responded to the call set to work trying to find a backhoe to help dig the horse out. In the meantime, one of the Wrenshall Fire and Rescue Squad members asked Zach what kind of ramp the horse would need to climb out of the hole. “He told us he thought something with a 45-degree angle would be enough for the horse to get out,” Laveau said. The rescue squad had shovels in their rig, so they shoveled for about 10 minutes to reposition the dirt around the edges of the sinkhole into a slope. Zach lifted himself out, and with a bit of encouragement, the horse followed suit. Laveau said that while the horse was “somewhat sweaty and shook up,” with a small cut on its shoulder, it seemed to be all right. “She looked pretty good for what she had gone through,” he said. Laveau said the sinkhole probably originated during last June’s flooding. He said there was a culvert under the trail that may have had a hole ripped in it, or perhaps a washout formed around it. The freeze and thaw cycles of winter may have further compromised that portion of the trail, and the weight of the horse caused it to cave in. Dubrent arrived with a horse trailer to give Stormy a ride back to the barn, where she happily rejoined her foal as if nothing had happened. “I could not have asked for a happier ending,” Melissa said. This entry was posted in Pictures and tagged horse, Minnesota, sinkhole, willard munger state trail. Bookmark the permalink. 2 Responses to Wrenshall, Minnesota. May 25th, 2013.